Imagine flying 18 hours in what was called a flying boat in 1942. You'd be exhausted and chilled to the bone. That is when and why this Irish whiskey, coffee and cream beverage was created. It happened in Limerick, Ireland, at an airport restaurant. As I understand it from reading (no, I wasn't there) from 1939 to 1945 air travel from America was by flying boats. These aircraft were landing at an airport in Limerick, Ireland after a long, cold 18 hour flight (Shannon Airport). 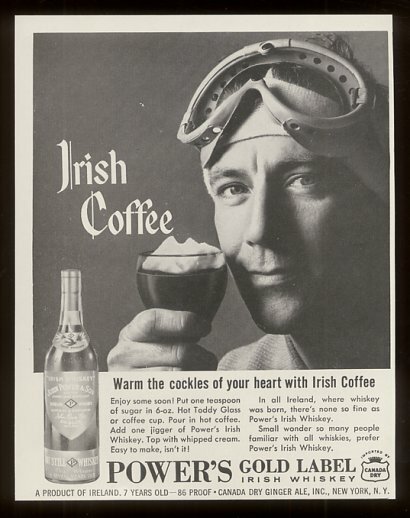 Instead of just offering coffee or tea to the travelers, a Mr. Joseph Sheridan, the Chef at the airport restaurant, developed this beverage - now a famous and favorite restaurant drink recipe. I sell a great deal of this beverage at the restaurant, especially during the fall and winter months. The restaurant recipe I use is the original as developed by Chef Sheridan (later to move to San Francisco where he introduced the drink to more Americans than just air passengers). Do not stir after adding cream. 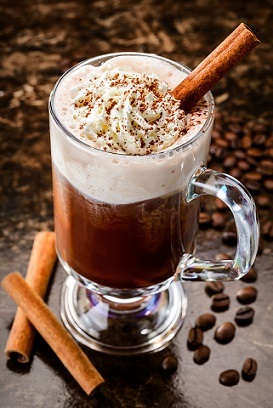 The best flavor is obtained by drinking the coffee and whiskey through the cream. Thank you, Chef Sheridan! Enjoy your famous coffee and Irish whiskey drink and the company of those you share it with! This is another famous restaurant drink recipe.